A Scandal of the Secular Conscience? The belief that religious conservatives are less charitable and more hard-hearted than secular liberals has seemed so obviously true as to require little empirical investigation. In fact, conservatives themselves have helped fortify this view by accusing liberals of possessing "bleeding hearts" and by amending conservatism with "compassionate." Religious believers have fared little better. Even serious evangelicals, such as Ronald J. Sider, conclude that Christians live just like the secular world despite their convictions. But as the ink dried on Sider's The Scandal of the Evangelical Conscience, Arthur C. Brooks' Who Really Cares soon followed with a starkly different conclusion. Drawing on some ten data sets, Brooks finds that religiosity is among the best predictors of charitable giving. Religious Americans are not only much more likely to give money and volunteer their time to religious and secular institutions, they are also more likely to provide aid to family members, return incorrect change, help a homeless person, and donate blood. 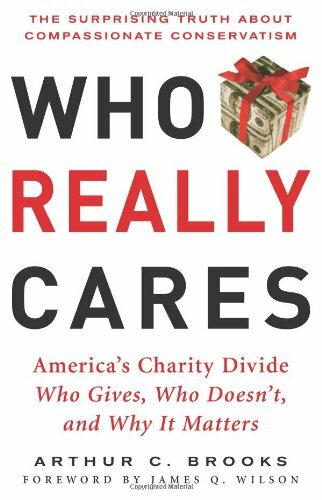 In fact, despite expecting to find just the opposite, Brooks concluded: "I have never found a measurable way in which secularists are more charitable than religious people." Consider some examples. Religious citizens who make $49,000 gave away about 3.5 times as much money as secular citizens with the same income. They also volunteered twice as often, are 57 percent more likely to help homeless persons, and two-thirds more likely to give blood at their workplace. Meanwhile, those who insist that "beliefs don't matter as long as you're a good person" are not as good as those who do think beliefs matter. The former group gave and volunteered at much lower rates.